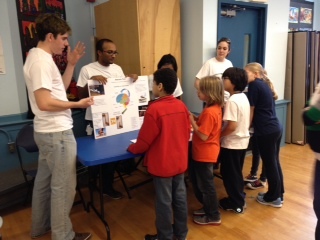 For Brain Awareness Events, students, postdocs, and technicians affiliated with the Neuroscience Programs at Weill Cornell Medical College and Rockefeller University visit New York City public elementary schools to teach students about the brain. After a brief introduction about the parts of the brain, students are divided into small groups and rotated among five stations where topics discussed included: Learning and memory, vision, taste, touch, and motor control. At each station, students are encouraged to ask questions and touch interactive displays (e.g., plastic skulls, neuron models, and plaster cat and rabbit brain molds) to get a better understanding of the lesson. 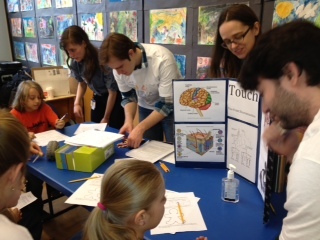 Similarly, students participate in object recognition tasks to understand short and long-term memory. At the end of the session, students take home pencils, “brain” erasers and handouts as reminders of the brain’s importance in our everyday lives. Each year, the topics change and we look forward to upcoming sessions. Dr. Teresa Milner,PhD (BMRI) has played an important role in organizing and realizing the participation of the BMRI in Brain Awareness Events in New York City.